Cotton Jointed Cloth Body from Secrist. (Only a few left) - Limited Edition 'Finley' 19" Unpainted Reborn Kit. Complete Unpainted Newborn Kit by Berenguer. Create a 17" baby doll. 1 cloth body, 5 ties. 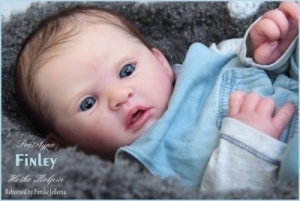 "Mary" Unpainted Newborn Doll Kit by Berenguer. Create a 21" baby doll. 1 cloth body & ties.